From Right to Left: The Globe's Sean Stanleigh moderates at panel including Lisa Taylor, chief executive officer of Challenge Factory, Eileen Dooley, vice-president at VF Career Management, and Vanessa Cohen, senior vice-president in the technology practice of Environics Communications. They were speaking at The Globe and Mail’s Human Resources summit: Solving Workplace Challenges in the Modern Economy on June 21, 2017. 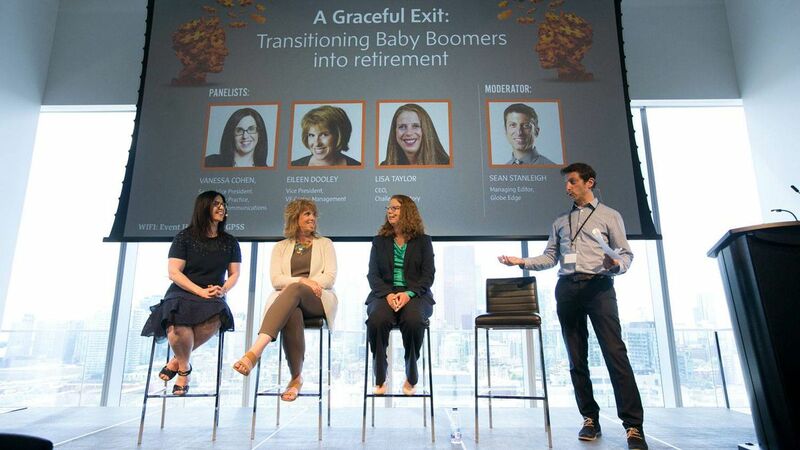 It seems there are many no-no's when it comes to talking about millennials and baby boomers at work. Specialists in workplace trends even suggest dropping the overused "millennial" label, in particular, from the discussion altogether. And while we're at it, they suggest dropping job titles too, or at least refrain from overemphasizing job titles on résumés, since many of those titles belie how rapidly job roles and functions are changing. That was the broad message from two recent panel discussions, one on millennials, one on boomers, held during the The Globe and Mail's Human Resources summit: Solving Workplace Challenges in the Modern Economy, where the 2017 Employee Recommended Workplace Awards, which recognizes companies that put the health and wellness of their employees first, were presented. The award was co-created by The Globe and human resources consulting firm Morneau Shepell. Despite the different needs of both age groups (boomers looking to transition into later stages of their careers and to find a sense of legacy in their work; millennials seeking new ways to find careers having purpose and meaning), there are nevertheless many trends that cross generations. For one, there's the attitude of just saying no to the status quo regarding job titles. Companies hire based on what they anticipate they'll need five years from now, but "the reality is that none of those skill sets will ever make any sense on a résumé," said Dave Wilkin, founder of the career networking service TenThousandCoffees.com, speaking at the panel on millennials. In other words, titles and formal résumés can be meaningless. It's what employees can do that's more important, since jobs are changing so rapidly. "Anybody who looks at their parents and says, 'What should I do when I grow up,' will never get an accurate response, because the jobs that existed five years ago don't exist today," he said. That's of course an exaggeration. But "what that means is that we need people to be creators and not managers," he said. It means figuring out "how can the next generation actually create their own opportunities, be it creating their own companies, or actually creating opportunities inside their organizations," he argued. The stereotype is that younger people are more nimble and tech savvy and therefore have technical skills that employers need. That may be true, but it's an assumption that only goes so far. As Mary Barroll, president of the job listing service Talent Egg, said that employers "believe they can teach technical skills, but they can't teach character." Employers are looking for signs of leadership, she said. "They are looking less for a person who fits a particular slot, but really it's more about the person." Similarly, Jacqueline Foley, chief marketing officer at executive search firm Odgers Berndtson Canada who also helps run the CEO for a Day program, allowing students to meet and shadow chief executives for one day, noted that the real job interview comes not when candidates are being formally interviewed. It comes "when we have lunch or a social function afterward, and all the partners come in, and we're all just chitchatting. And that's when you really see how they interact with people." Work and career building (or career transitioning later in life) is about the experience of work and being able to handle many different functions, they suggested. The panel on baby boomers stressed this even more for older workers. "A big part of it is separating your title from your skills, and it's actually advice you can give to any age group," said Eileen Dooley, vice-president at VF Career Management. "When I take a look at a résumé, for example, I always ask, 'What on here are you good at, but that you don't want to do any more?'" Another key element is knowledge transfer. Younger workers need the institutional knowledge and wisdom of older workers. Older workers seek legacy, although here too is another no-no, argued Lisa Taylor, chief executive officer of Challenge Factory, a consultancy and analytical firm focusing on the aging work force. Ms. Taylor feels that knowledge transfer is too rigid. It implies the passing down of know-how in a formalized, possibly antiquated way. Instead, she said it should be more of a translation of knowledge, imparting knowledge in ways more relevant to current needs – in other words, forgetting the generational divide and any sense of stiff mentorship for more of freer-flowing mentorship/reverse-mentorship interaction. "As an organization, you either have a culture of collaboration, or you don't. If that person is resisting collaborating or sharing information, chances are that's a pattern that has existed over the course of their career. And it's either something fostered within the culture of the organization, or it isn't," she said. Some of this resistance can come from how older workers are treated. "We know in Canada that training for older workers starts to decline at age 49. That's very, very young. We know that subtle cues start to be given through organizations, that it's kind of time for them to start thinking of moving somewhere, not here," Ms. Taylor said. But that's a flawed approach. All workers, young and old, former employees and retired ones, inevitably remain brand ambassadors for the remainder of their lives. So, companies should make that a positive relationship, as much as possible. Here, once again, it's about the experience one has at work, regardless of generation, job title and skill set. Vanessa Cohen, senior vice-president in the technology practice of Environics Communications, put it succinctly for both millennials and boomers: It used to be about promotions and titles. Now it's about who you are and what you want to be.